Research shows that the best drug prevention strategies tie together the school, home, and community into one effort. Most programs excel at one or the other, but few reach all facets of a teen’s life. 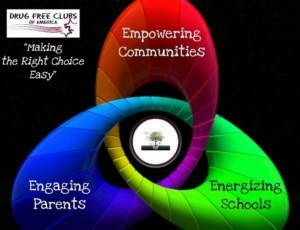 Drug Free Clubs of America engages EVERYONE. Schools, businesses, parents, and students (either as participants or club leaders). Because of this, DFCA members get consistent support no matter where they are in their day. Including students in the leadership of the club also leads to a wide variety of students who participate. On test day, students are often surprised to learn that their membership in DFCA is something they now have in common with others they never felt similar to. By bringing together school, parent, and community efforts, members benefit from an overall positive sense of belonging regardless if they are at school, at home, or out enjoying their community. Reduced drug use results in decreased crime and a more reliable youth. Businesses prosper by showing patrons that they are community leaders, invested in the next generation. Drugs affect a student’s ability to learn. Students who use drugs are more likely to be violent, disruptive and unsuccessful in a healthy learning environment. Enjoy the priceless peace of mind that comes with knowing their child is drug free and has a powerful safety net to protect that choice under pressure. Members of Drug Free Clubs of America are eligible for countless benefits. This includes not only the immediate rewards and perks, but also the long-term rewards associated with a drug free adolescence such as a reduced likelihood of adulthood addiction, better realization of goals and a more promising future.